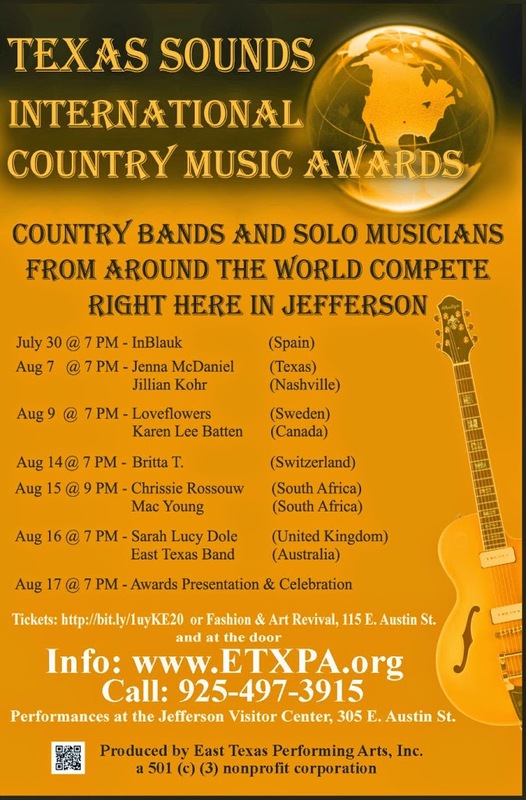 International Musicians converge on Jefferson Texas, brought to town by the East Texas Performing Arts for their 2014 Summer Theater and Music Festival. Texas Sounds International Country Music Awards is like no other festival in our area and the potential for growth is huge. In fact there are right now more and more renowned local artists who are excited to join the festival. Musicians are coming from around the world from the Countries of England, Sweden, South Africa, Australia and America to name a few. The artists play primarily Country Music style songs. This is much bigger than the previous years and at the end of the festival is an Awards Evening. It all started with a band called “East Texas” from the Deep South – of Australia. When you watch their video of CC Rider you can’t help but want to get up and dance. Then one by one each band came online to join the party. Our local talent has joined the line up as well so you will be able to experience the best of East Texas Sounds. All performances are general seating so get there early for best choices. Tickets are available online which would be the best decision for the performances. You may purchase tickets for one performance or package tickets for all. Tickets can be bought at the East Texas Performing Arts website now. *Side note; at the time of this article there were still artists being scheduled and some performances may be changed based on arrival of bands. I will update as necessary. This entry was posted in Music Festival, Theater by Tammy D. Bookmark the permalink.